In this article, We will learn program to calculate compound interest in Kotlin. In simple terms, Compound interest is the sum of principal amount and interest of interest. In this program, we will take input from the user to enter to get principal amount, rate and years value. To do so we have used readLine() function. compound interest formula is A = P(1 + r/n)^nt. 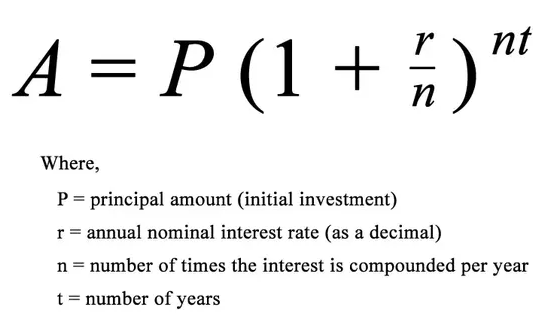 Where "P" is the principal amount, "r" is an annual nominal interest rate and "n" is the number of years. Same is printed using print() function.